In an email to Labour Party members this evening, Jeremy Corbyn confirmed that Labour supports the campaign for another public vote on Brexit “remaining on the table” if a general election is not possible. 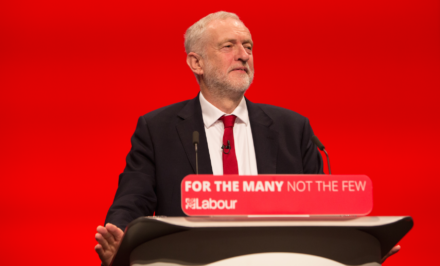 Although this is simply a reiteration of existing party policy, ‘people’s vote’ campaigners have expressed concerns about Corbyn’s recent comments on the efforts to secure another referendum on Brexit. At Labour conference in September, the composite motion agreed by the party pledged to “support all options remaining on the table, including campaigning for a public vote” should it not be able to secure a general election. But last week Corbyn gave an interview to Der Spiegel in which he said “we can’t stop Brexit”, and later told Channel 4 that he wouldn’t agree with Jo Johnson’s call for another referendum. Interviewed in a ‘Reach Fest’ event on Wednesday night, Corbyn was asked whether he would back a public vote and replied: “That’s not a priority”. If Theresa May’s deal is voted down and the opposition cannot force a general election, it is hoped by some pro-EU Labour groups that the party will get behind the ‘people’s vote’ campaign as a way of breaking the deadlock. There may then be some debate over whether to exclude the option of ‘no deal’, which Remainers would argue could be dangerous, and whether to include the option to remain in the EU, which may cause others to worry about the optics of re-running the 2016 referendum. Below is the full text of Corbyn’s email to Labour members. The government is falling apart before our eyes. Their half-baked deal has unravelled, the Prime Minister has lost all authority and is clearly incapable of delivering a Brexit deal that commands even the support of her Cabinet – let alone Parliament and the people of our country. Our Party Conference agreed that this deal would be judged against our six tests, and if it failed to meet them we would vote against it. After two years of bungled negotiations, the government has produced a botched deal that breaches the Prime Minister’s own red lines, does not meet our six tests and will leave the country in an indefinite halfway house without a real say. As I said in Parliament earlier today, people around the country will be feeling anxious about the industries they work in, the jobs they hold and the stability of this country. We do not accept that the choice is between the government’s deal and ‘no deal’. We will work across Parliament to stop a ‘no deal’ outcome. Labour has set out our alternative plan for a sensible Brexit that would work for all of our nations and regions, bring Parliament and the country together, support jobs and our economy and guarantee rights, standards and protections. If Parliament votes down this shambolic Tory deal — as seems likely — this will represent a loss of confidence in the government. In those circumstances the best outcome for the country is an immediate General Election that can sweep the Tories from power and deliver the Labour government this country desperately needs. If we cannot get a General Election, in line with our conference policy, we will support all options remaining on the table, including campaigning for a public vote. We are ready to lead, ready to deliver a sensible deal that works for all our regions and nations and ready to build a Britain that works for the many, not the few.